On October 31st, 2017, our friend Lisa Burns found out that she had stage 2 breast cancer. Her case is a little complicated though. She has two types of breast cancer HER2 negative, estrogen positive and HER2 positive, estrogen negative making it more difficult to treat. She is also BRACA1 positive making her at a high risk for recurrence. 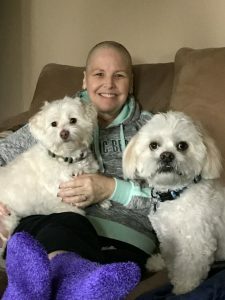 This means that in addition to chemo and radiation she also needs a hysterectomy and a double mastectomy to lower the chance of her cancer coming back. Since her diagnosis, we have done everything we can to help her on her journey. Watching someone go through cancer treatment makes you feel absolutely helpless. 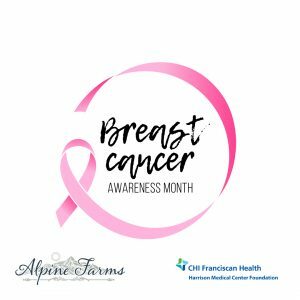 That is why we felt inspired to create a wreath designed for breast cancer awareness, with 50% of the proceeds being donated to the Harrison Medical Foundation in Bremerton, WA. Trying to decide which charity to donate to weighed heavily on our hearts, and we ultimately decided to donate as directly to Lisa’s oncology department as possible. The Harrison Foundation has agreed to put our donations directly into their breast cancer oncology department. Lisa has agreed to share her story with us throughout this season to help raise awareness for breast cancer. 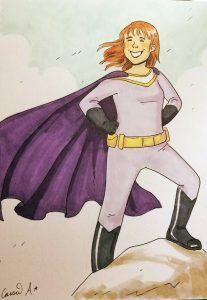 Meet Lisa Burns: Our Hero with a Purple Cape. Lisa is one of the most loving and positive women I have ever met. I have known her my whole life…literally! She was there at the hospital, supporting my mom when I was born! She is a mother and step-mother with four sons, and she is Bubbi to her grandson, Emmett and my own son, Marcus. Her fun personality is infectious and her smile makes you feel like you are special. When she learned she had cancer and would have to go through chemotherapy, her response was to buy several funky hats (no scarves for her!) and have a head shaving party. It is excruciatingly difficult to watch someone you love go through chemo. You feel helpless and you just want to do something, anything to provide them with some semblance of relief. Ok, what’s up with the purple cape reference? I know that breast cancer’s color is pink. However, let’s talk about the color purple for a minute. For one, it’s my most favorite color, so much so that my car is grape. Purple is the color of passion and purple lifts my spirit. My purple cape reference is from the power of purple for me. When I look at purple, it gives me strength and energy. It speaks to my soul. The philanthropic arm of Harrison Medical Center supports those who wish to contribute financially, and by doing so, supports the Center’s own mission of making a “positive difference in people’s lives by providing exceptional health care.” As a not-for-profit charity, those who donate to the Harrison Medical Center Foundation can be assured that their gifts go right back into the community they care about. I hope that you all will join us in any way that you can to support Lisa’s journey, as well as the doctors who have helped her along the way. I dream that we can come together and be the purple cape for all of the people out there who are fighting their own battles with breast cancer.